Rosalie Winard’s photographs of birds are dramatic, timeless and a little otherworldly. Her subjects, wetland birds like great egrets and American white pelicans, often take on qualities of mythical creatures or angels. Her visual palette consists of shadows and light, movement and stillness. There is joy in her photographs, but also a touch of melancholy—these majestic creatures and the habitats they rely on for survival are in danger. Winard’s photography is a form of activism, a visual campaign for conservation. Winard didn’t always combine art and activism. Before she became an award-winning photographer, she just loved birds. As a college student majoring in natural history, she spent countless hours alone on a canoe studying the behaviors of brown pelicans. At the time, she didn’t even own a camera, but the visual beauty of the birds spoke to her. But she didn’t have a language to convey how she felt to the rest of the world until a series of happy accidents led her to photograph great egrets using a rare kind of film called black and white infrared. The results were astonishing. “I got something that really showed the feeling of what the birds had always meant to me,” she says. Originally from Brooklyn, Winard relocated to Salt Lake two years ago to continue her work. 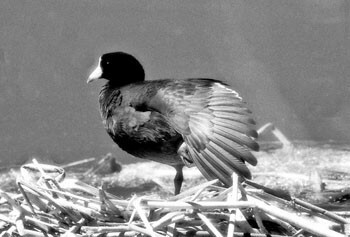 She is currently photographing the birds of the Great Salt Lake for an archive project that will be available for public use at the special collections of the University of Utah Marriott Library. Cycles are an important part of the Great Salt Lake. Because it’s a terminal lake, its depth is in constant flux. In 1963, the lake’s depth reached an all-time low of 24 feet. At its highest (in 1986), the lake had a depth of 45 feet and caused so much flooding that it had to be pumped into the West Desert. Even though these extreme variations can be problematic, they come from natural cycles that lead to balance over time. Winard’s concern is about cycles that are the result of unsustainable human activities, cycles that are spinning out of control. Winard experienced her first Salt Lake inversion this year. Along with the inversion came worries about her own health as well as the health of the birds. “My big fear for the lake between the pollution that’s happening and the development that’s being allowed to continue is that there is a certain point I fear the birds are going to get poisoned,” she says. 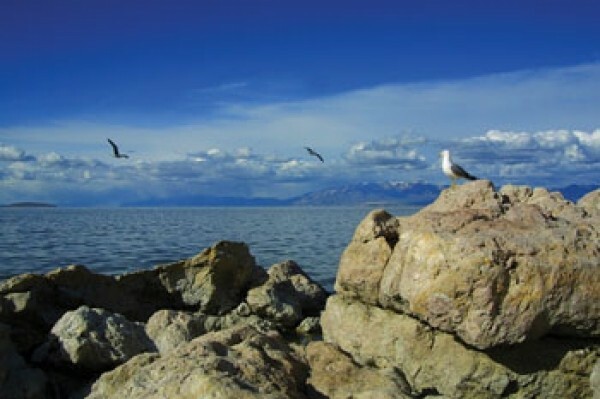 One obstacle to protecting the birds of the Great Salt Lake is that many native Utahns have no idea how vitally important the lake is to birds from all over the world or even that some of the most spectacular species on the lake are there. “I would say 19 out of 20 people have no clue there are white pelicans here,” Winard says. She says there’s still hope for change, however. She remembers a time when the word “ecology” was hardly spoken, let alone a major part of public discourse. “The environment is so important to everybody now, and it wasn’t 20, 30 years ago,” Winard says. She points to recent protests against extending Legacy Highway into Farmington Bay as a sign that people are beginning to wake up to the importance of the lake and the dangers it faces. Winard encourages anyone who wants to help protect the lake to join Friends of the Great Salt Lake, a nonprofit organization dedicated to preserving the lake through education, research and advocacy. She also suggests we reach out to our political representatives. “There are environmental impact reports that are done, and then there’s always a period of time for public comment,” she says. Hawk Watch is an organization dedicated to the conservation of raptors. Volunteers who work with Hawk Watch will have unforgettable bird encounters. In order to assess the health of various species, the group conducts migration counts to detect population increases or declines. During the fall migration, members of the public are welcome at their Goshute migration site near Wendover. “Chances are, they’ll actually get to release a trapped and banded raptor back into the wild,” says Joseph Dane, development and marketing coordinator. Todd Stout’s love of butterflies inspired him to create Utah Bug Club, a club for children and their families to learn everything they need to know to identify, capture and raise butterflies. He also leads field trips for anyone who is interested, at no charge. “I think a lot of people get caught up in how beautiful they are and their metamorphoses, but for me I think it’s traveling to find butterflies in their natural habitat and understanding how they survive that kind of makes it addictive,” Stout says. Helen Dishaw, Tracy Aviary’s curator of bird training and education programs, describes the aviary as “a little natural oasis in the middle of the city.” Located in Liberty Park, the aviary is an easy, accessible way to enjoy and learn to appreciate birds, even if you only have an hour or two. On April 20 from 12-3 p.m., Tracy Aviary will be hosting Party for the Planet to celebrate Earth Day and the aviary’s 75th anniversary. The first 75 people to arrive will receive a free gift.